Here's how you can book a treehouse! For Pete Nelson, who hosts "Treehouse Masters" on Animal Planet, these structures are not just a childhood fascination: They're his whole life and business at Nelson Treehouse and Supply. 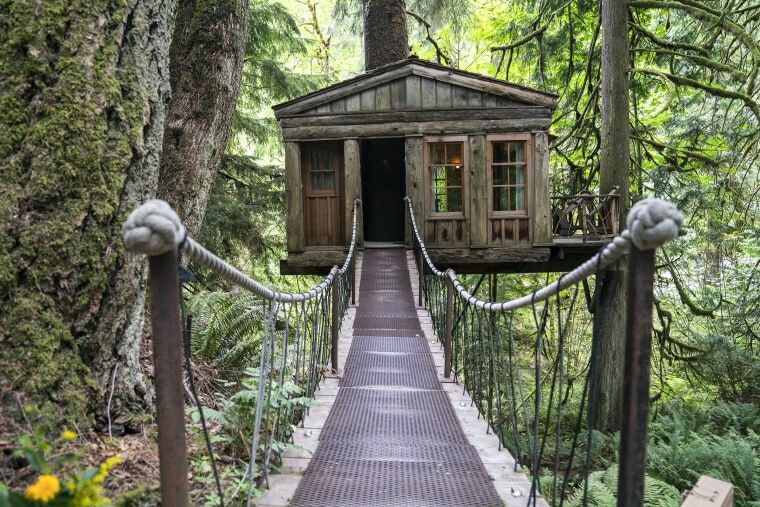 Nestled about 30 minutes east of Seattle sits TreeHouse Point, a stunning 4-acre retreat and event center that Nelson runs with his wife, Judy, since 2006. The treehouses are not just to look at on a guided tour: You can rent them! "It's all about being in the woods," Nelson told TODAY. "I was so struck by it when I found that property now 12 years ago already. It's really just about immersing yourself in that kind of environment and doing it in the natural way." The Nelsons welcomed TODAY Home to get an inside look at some of these unique structures in the trees. Pro tip: Use the mouse to guide your way through space and click to zoom. The white circles contain more information and fun facts! Use a VR headset for a fully immersive experience. Temple of the Blue Moon was the first treehouse they built on the property, where visitors have to cross a long suspension bridge to get inside. "Part of the fun of creating these is that they are all different," Nelson said. "It's kind of corny but it feels like they're like snowflakes. No snowflake is the same as the other, and it's true with treehouses, too." That's especially true about the six treehouses at TreeHouse Point. Some have bridges while others have a ladder; one features bunk beds while some have two stories like a house. "Each time that I approach a project, it can be something completely different than anything we've done before," Nelson said. When it comes to building one of these masterpieces in the trees, Nelson says it takes him and his team at Nelson Treehouse and Supply about a month with a crew of three or four people. And that includes electricity and plumping! Nelson fell in love with treehouses when he was 5 years old after his dad built him a fort behind their family's garage in New Jersey. He told TODAY Home that becoming a proprietor of a bed-and-breakfast was never part of his original career plan, but he loves taking on the responsibility. I just want people to feel what it's like to wake up in a forest like that. "Part of the fun that I didn't realize was going to be such a big part of it is the people that come and stay are treehouse people," he says. "It's really such a pleasant surprise to find that we've attracted these people that want to come out and experience that." They cost $300-$400 per night, and you have to be 13 years or older to spend the night. “Treehouse Masters,” which kicked off its 11th season in August, airs Friday nights at 8 p.m. ET/PT on Animal Planet.